Morphology-based magnetic resonance imaging (MRI) is clinically used to identify and monitor pathological changes of the spine in many diseases (e.g. osteoporosis or lower back pain) [1–3]. Quantitative MR including magnetic resonance spectroscopy and chemical shift encoding-based water-fat MRI allows for reliable determination of muscle and bone marrow fat composition [4, 5]. It can be used for the quantitative assessment of muscular tissue composition in neuromuscular disorders and their longitudinal monitoring [6, 7]. It was reported that intramuscular fat is increased in patients with neuromuscular diseases and lower back pain [3, 7–10]. Bone marrow malignancies, osteoporosis and distinction of the fractures are also common fields of application for quantitative MRI [11–13]. Compared to quantitative MRI, morphology-based MRI with the subsequent qualitative analysis and generation of semiquantitative parameters is limited in this context considering interrater objectivity and experience-based follow up evaluation . 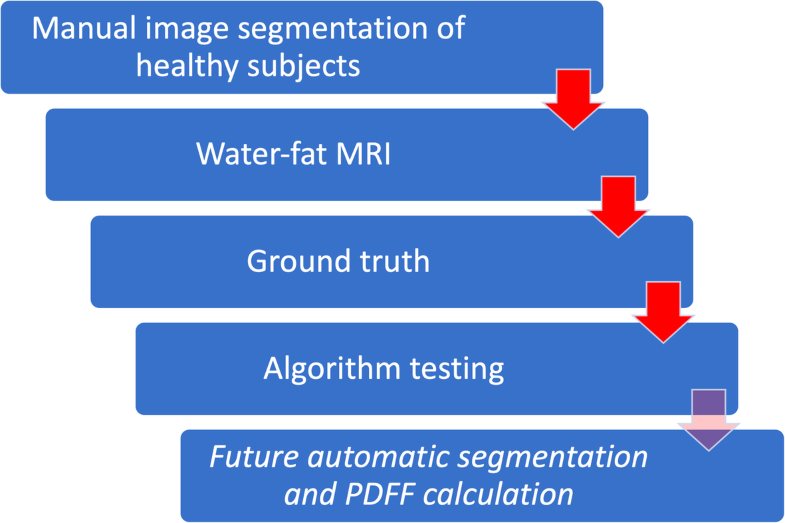 Proton density fat fraction (PDFF) can be calculated based on chemical shift encoding-based water-fat MRI [15, 16]. However, up to now a manually segmentation process is needed to extract PDFF values from the lumbar muscles and the vertebral bone marrow. This is time consuming and therefore limiting the clinical applicability. Clinicians as well as scientists would strongly benefit from automated segmentation methods. Despite some recent developments in (semi-) automated segmentation techniques in different imaging disciplines their transfer into clinical routine is still challenging [17–19]. Previous work reported possibilities for muscle and vertebrae segmentation in MR images [20–23]. These algorithms require large datasets to test their performance and to further develop them. However, the public availability of manually segmented datasets of lumbar muscle groups and vertebrae as ground truth are limited. Recent and future trends of imaging automatization are and surely will be influencing many aspects of radiological diagnostics now and in the future. Subspecialties as neuroradiology, breast imaging, musculoskeletal radiology and oncological imaging are affected regarding (semi-) automated initial diagnostic finding, disease monitoring and report classification [18, 27–29]. Our aim with offering a database for manually segmented lumbar muscles and vertebral bodies (L1 to L5) in MR images of 54 healthy volunteers is to provide ground truth data which supports testing and refining newly developed computer vision or machine learning algorithms for automatic lumbar muscle and spine segmentation. The present database offers access to water, fat and PDFF maps.